Hi Asod! 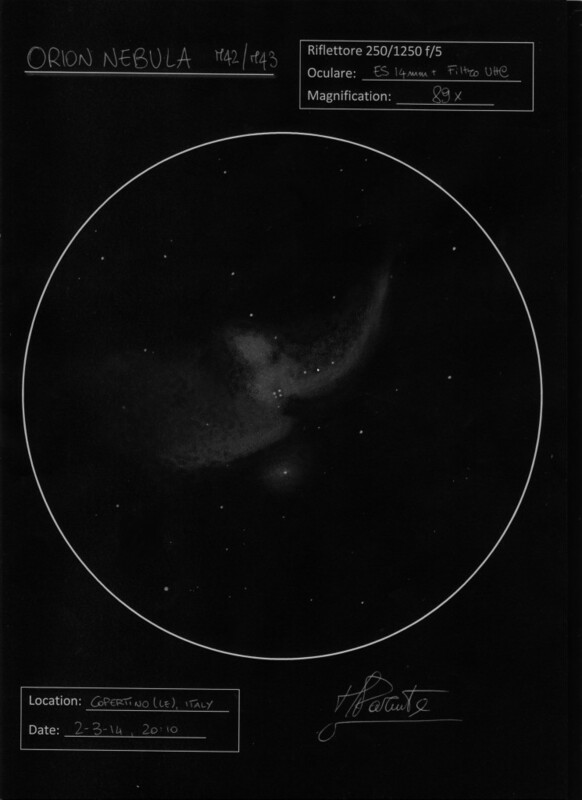 This is the Orion Nebula and M43, sketched by me with my Dobsonian Telescope f/5 10”. I think M42 is the most beautiful object of our sky, i cried when I saw it the first time. So I decided to sketch it; I spent 45 minutes and I used black pencil on White paper, then the sketch was inverted and elaborated at computer. I hope you enjoy it! Hi Massimiliano, I was also very impressed when I saw first time this nebula. There is quite no winter sky observation I miss watching it. Very nice representation, I recognized it at a glance, before reading the title. Good job. Did you use a OIII filter ? An excellent capture of the great nebula.